Greenwood City Hall is located at 101 West Church Street, Greenwood, MS 38935; phone: 662-453-2246. Photo: Rosemary-Humphreys House, ca. 1916, 1440 Grand Boulevard, Greenwood, MS. 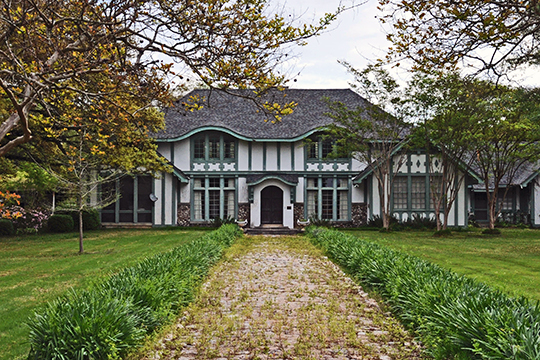 Listed on the National Register of Historic Places in 1980. Photographed by user:Jerrye and Roy Klotz, MD, 2008, (own work) [cc-by-4.0 (creativecommons.org/licenses/by-sa/4.0/)], via Wikimedia Commons, accessed November, 2015. Greenwood is located in the heart of the Yazoo-Mississippi Delta, that rich fertile region of Mississippi that stretches from Vicksburg to Memphis and is bounded on the west by the Mississippi River and on the east by the Yazoo River. The town began as a small settlement called Williams Landing, named for John Williams who, in 1834, acquired a 162-acre tract of land on a high point on the Yazoo River. The Williams Landing site is included within the boundaries of the Williams Landing and Eastern Downtown Residential Historic District. In 1844 the town was officially organized as Greenwood, named in honor of Greenwood Leflore, the last chief of the Choctaw Indians east of the Mississippi River. Born in 1800, Leflore was elected chief in the 1820's and was involved in the Dancing Rabbit Treaty negotiations that resulted in the westward movement of the Choctaw Indians in the 1830's. Greenwood Leflore, however, did not move westward with the Choctaws. He chose to remain in Mississippi and reputedly profited from government grants given in repayment for his role in negotiating the Dancing Rabbit Treaty. Leflore became a cotton planter and one of the area's most substantial citizens. He died in 1865, not long before a newly created county was named Leflore in his honor and Greenwood became its county seat. Before the Civil War, Greenwood's participation in the creation of Mississippi's great cotton kingdom was limited to being a shipping point for cotton grown in the Delta. Although its population was only 150 in 1852, Greenwood's location in the very center of the Delta and on one of the highest points on the Yazoo River made it a relatively busy shipping port. During this period of the state's history, cotton grown in Mississippi was marketed in New Orleans or Memphis, rather than in Natchez or the other cotton towns in the state. After the Civil War, the development of the federal levee system opened up hundreds of thousands of acres to cotton production in the Delta. Earlier, the annual flooding had prohibited the full exploitation of the fertile Delta soil. By the 1890's, cotton production in Mississippi had surpassed the peak production during the years prior to the Civil War, and the Mississippi Delta became the center of the state's second great cotton kingdom. The Delta region was the only area in the entire South to show consistent profits from cotton cultivation in the later part of the nineteenth century. Cotton production continued to increase throughout the first third of the twentieth century until the Great Depression signaled the end of the second cotton kingdom era. Changes in the way that cotton was marketed were primarily responsible for Greenwood's transformation from a small settlement to one of the state's most rapidly growing communities. Rather than being shipped from the Delta and marketed in New Orleans and Memphis, as had been the practice before the Civil War, cotton began to be graded, sold, and shipped from the Delta directly to the buyers. Greenwood's location on the Yazoo River in the heart of the Delta and the introduction of the Yazoo and Mississippi Valley Railroad in 1886 combined to assure the city its position as the marketing center for Delta cotton. Cotton offices began to appear first along Front and Market, the streets closest to the southern bank of the Yazoo River. In a typical cotton office were graders, who determined the quality of the cotton, and factors, who acted as agents for the planters in the sale of the cotton. Mary Warren Miller, preservation consultant, Historic Natchez Foundation, Greenwood Multiple Resource Area, Leflore County, Mississippi, nomination document, 1985, National Park Service, National Register of Historic Places, Washington, D.C.